Adult Services are designed to enable blind and visually impaired individuals to regain independent living skills, allowing them to maintain meaningful roles in their family, community, work and/or school. All classes are available in English, Spanish and Creole. Instruction and training at work and in the home is also provided to ensure practical skill use in everyday situations. Clients meet with a counselor or social worker and are orientated within a small group class to discuss available classes and services. Miami Lighthouse and Bascom Palmer Eye Institute Collaborate on Vision Rehabilitation services. We emphasize using one’s own life experiences to regain skills using remaining vision and other senses. Social workers act as advocates and information providers and teach the skill of self-advocacy. Click here to learn about the Transition Program for students ages 14-22. The Independent Living program is for individuals who are not employed and intend to remain in their homes. These clients have the opportunity to receive orientation and mobility training and personal management instruction. They can also receive basic computer training, participate in our social group activities, receive low vision services, as well as counseling services. Our independent living program consist of two age groups; Independent Living Adult Program (age 54 and under) and Independent Living Older Blind (Age 55 and over). In 2015, the two Independent Living Programs served 158 clients were served with a 6,305 hours of service. Proper training from our university-trained, certified instructors builds confidence and independence for an individual maneuvering in a sighted-world. Writing guides, check writing templates, Braille and various labeling techniques provide options for handling the many reading and writing tasks associated with a busy schedule. Use of the Talking Books program introduces one avenue of enjoying leisure time. For more information, please contact Raquel Van Der Biest. Growing advances in technology allow an visually impaired individual to lead a more independent life, therefore it is necessary to have the proper training to learn, and in many cases re-learn the skills needed to utilize what is available. Miami Lighthouse has computers adapted to provide either enlarged images or speech output of the information on the screen, and can be used for basic word-processing and e-mail. We are also equipped with computers using JAWS (Java Application with Sound) software, a program that reads allowed virtually every keystroke on the computer, allowing the user to listen to emails and other documents, and navigate computer programs as a sighted person might. Small talking note-takers make it possible to remember appointments, and get quick access to telephone numbers and personal information. Other special equipment such as Braille note-takers and laptop devices also enable greater flexibility on a daily working basis. Similar to a PDA, these devices allow the user web access, access to a calendar, contacts, notes, documents and much more. Learning to use this puts the world literally at your fingertips. For more information please contact Bill Rivera. The Vocational Rehabilitation program is for clients that are either working or want to go back to work. The program provides comprehensive training in self-help skills, computer/adaptive technology and job readiness; other services provided through the program include orientation and mobility, low vision services, personal and home management. In 2015, 154 clients were served with 11,123 hours of service. Miami Lighthouse helps analyze a blind or visually impaired individual’s skills and interests to assist in the search for employment. Increasing one’s personal independence allows for greater opportunities in the work environment. Participants develop a career plan geared towards achieving sustainable employment. Training provides individuals with skills needed to enter, remain in or return to suitable employment. Participants acquire skills such as effective resume writing, job searching techniques and interview skills are practiced with expert coaches. For more information please contact Corina Hernandez. Employers - click here to view our Job Readiness Brochure. 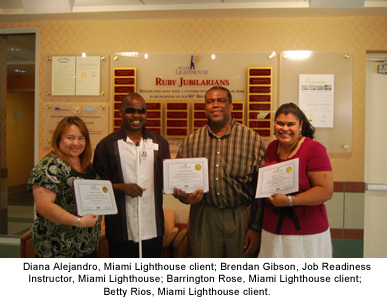 Unemployed blind or visually impaired candidates who are seeking employment complete the Vocational Rehabilitation (VR) program offered at Miami Lighthouse for the Blind. Our goal is to obtain or continue employment and educational activities for individuals as full participants in the community. During their training at Miami Lighthouse, clients learn computer skills adapted to their vision impairment. VR clients also receive high-quality training in adaptive computer access using auditory screen reading and large print magnification devices as well as Braille reading/writing and the use of electronic book readers and electronic Personal Digital Assistance access. In addition to work readiness skills, social skills and basic communication are part of the program currently offered. A Job Developer provides additional assistance with skills assessment, interview skills, job opening searches, and preparation for specific job opportunities to help visually impaired individuals obtain competitive jobs in Miami-Dade or Monroe counties. The Job Developer also searches for appropriate job fairs and prepares blind or visually impaired job candidates to participate in these events. The Job Readiness Program at Miami Lighthouse for the Blind and Visually Impaired is partially underwritten by funding from The Able Trust and the Florida Division of Blind Services. GED Program - Adult Basic Education, in partnership with Miami-Dade County Public Schools, provides blind and visually impaired adults with the education needed to obtain their GED. Thanks to Miami-Dade County Public Schools “Million Dollar Community Literacy Challenge,” Adult Basic Education (ABE) is now offered as an innovative program that is designed to help someone gain the education they need to complete their GED. Miami Lighthouse is offering the innovative program in a collaborative community partnership with Miami-Dade County Public Schools. The program stresses basic education for adults and the opportunity to pursue their GED. In addition to Adult Basic Education, students have the opportunity to study English as a Second Language for those students whose first language is Spanish or Creole. Students attend class four days a week, with registration on a rolling basis so the program can be joined at any time during the year. In 2015, 62 clients were served in these programs with 12,569 hours of service. For more information please contact Michelle Fischer. To make an appointment for a low vision assessment or an in-home consultation, please call 786-362-7479. Low Vision Services assist patients in utilizing their remaining useful vision to stay independent by teaching them how to manage tasks of daily living despite their vision loss. Patients receive a functional vision assessment from our low vision optometrist who works with our occupational/low vision therapist and licensed dispensing optician to prescribe assistive devices. Training on devices and advice on improving the home environment are given on site and in the home. 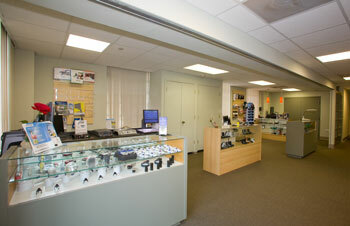 Click here to visit our Low Vision Solutions Center. Miami Lighthouse instructors will assist in the selection of these devices to fit your needs, and provide training in their use. Loss of vision increases the challenge of managing and understanding diabetes, a complex condition that often leads to vision loss. Talking devices that enable independent monitoring of blood sugar levels and special insulin delivery devices can help you manage your condition. Miami Lighthouse also provides information about meal plans, exercise, and personal health care. For more information on Adult Services, please call. Miami Lighthouse for the Blind and Visually Impaired in compliance with the State of Florida is providing our clients with information regarding the Federal CAP program. The following information will provide you with contact information and the summary of services given by the CAP program. CAP assists anyone with a disability that is interested in applying for and receiving services from rehabilitation programs, projects or facilities funded under the Rehabilitation Act. CAP helps individuals understand and deal effectively with programs established to provide these services, such as Florida's Division of Vocational Rehabilitation, the Division of Blind Services and Centers for Independent Living. CAP can investigate, negotiate and pursue administrative, legal and other remedies to ensure that client rights are protected.